The Cal Poly Pomona Petting Farm is now open for the season. We are open to the public on most Saturdays during the season, weather permitting. 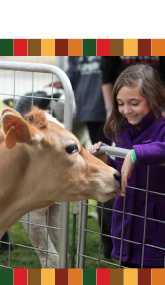 Children can pet and feed adorable farm animals including goats, sheep, rabbits, and a dairy calf. We also host parties and mobile events.